There's ongoing sense of serenity compounded by a feeling of sincerity and transparency in the cinema of Ashutosh Gowariker. This filmmaker never hides life's most essential truth in cinematic subterfuge. Rather, Gowariker goes the other way. He strips the emotional content of cinema of its accessories and trappings and leaves the screen with just that right amount of drama that does complete justice to the characters without making them a casualty of excessive creative freedom. Celebrate the creative freedom of a fearless and honest cinema. "Khelein Hum Jee Jaan Sey" (KHJJS) is an inherently dramatic story about a large group of young people who fought an unknown chapter in India's freedom movement, told on screen with a minimum amount of flag-waving bravura. The source material, Manini Chatterjee's novel, is open to an acutely pompous and self-important treatment. But when has Gowariker's cinema ever been a prey to pomposity? If he can make Akbar's court look so cool, casual and muted in spite of its inbuilt flamboyancy, the super-committed sepoys of self-government in KHJJS are not capable of even a second of verbal or visual overstatement. Going to a world that is strongly redolent of historic ramifications, Gowariker pulls the real-life material out of the textbook and transforms it into an eminently engaging story about anti-colonialism. This is certainly not Gowariker's first visit into Colonial India. Who can forget the director's neo-classic "Lagaan" where one villager gathered a whole team of ragged villagers to beat the Brits at their own game. KHJJS is not as playful, lyrical and lush as "Lagaan". This time Gowariker tells his story with brutal straightforwardness, a quality that is a hallmark of this exceptional director's cinema, here more prominently on display than in any of his earlier works. The epic satire of "Lagaan", the grandiosity of "Jodhaa-Akbar" and the transparent nationalism of "Swades" peep out of Gowariker's latest work in measured doses, though never in a way that suggests any calculated attempt to create a pre-given ambience. The setting, Chittagong in Bengal in the 1930s, is created with a fluency, virility and scrupulousness that make us believe in the characters and their mission from the word go. Watching out for those sleeping-dogs of over-statement, the narrative moves across a an artless criss-cross of patriotic plotting without tripping over in anxiety and nervousness. A sense of calm camaraderie prevails even during moments of unsettling bloodshed. This is no one-day mataram. The patriotic zeal never felt more tranquil before. This is history without hysteria. In KHJJS, each one of 70-odd characters seems born into his or her respective parts. Much of supporting cast does what it is expected to. It supports the drama and the tension with restrain and skill. Standing tall in the supporting cast is Sikandar Kher expressing indignance and ire without going over-the-top. Deepika Padukone sheds her pouty movie-siren's image confidently. She gets unexpected competition from debutante Vishakha Singh who seems to get under the skin of her character. But the film finally 'belongs' to Abhishek Bachchan in the way that films become the property of actors who own characters not for a display of histrionic vanity but because they grasp instinctively the world which the character inhabits. Abhishek's empathy with his character is complete and unimpeachable. As Surjya Sen, he conveys a muffled but obstinate idealism. Abhishek's eyes become his window to a world where pain governs the journey to a greater glory. Just as it's impossible to imagine Sanjay Leela Bhansali's "Black" and "Guzaarish" without Amitabh Bachchan and Hrithik Roshan, or Gowariker's "Swades" without Shah Rukh Khan, what, we wonder, would Surjya Sen be if Abhishek had not played him with such quelled anger, dignity and grace? Or for that matter where in our cinema today would history find a place if Gawariker was not committed to making compelling films on the indelible relationship between the present and the past? On the technical front, Kiran Deohans' cinematography and Nitin Desai's art direction are subtle delicate but evocative. 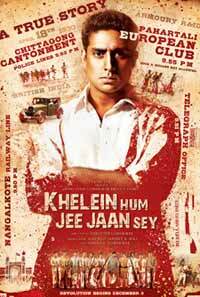 Sohail Sen's music fits in like a glove with the film's theme and mood of restrained revolution. Don't expect the bombastic patriotism of Manoj Kumar's "Kranti" or the tax-exemptible desperate nobility of "Gandhi - My Father". The effectiveness of Gowariker's drama is drawn from the director's determination to keep his drama denuded of exhibitionism. "Khelein Hum Jee Jaan Sey" is the kind of rare and precious cinema on the theme of idealism, nobility and nationalism that is being progressively pushed out of our cinema by crass boorish comedies. It must be seen not because it retrieves a forgotten chapter from our history, but simply because it's a story so well told you forget it's a true story. The truth of the moment in the cinema of Gowariker is the only truth that matters for the audience. The rest is history.